The new kit has been universally praised by fans, and for good reason. In an age of all sorts of "technological advancements" for jerseys, this is a clean, classy design from Nike. And I don't think the centennial crest will be the new permanent team logo, but it could at least be a hint that the old ugly logo is on its way out for good. But I'm not so happy about this jersey. 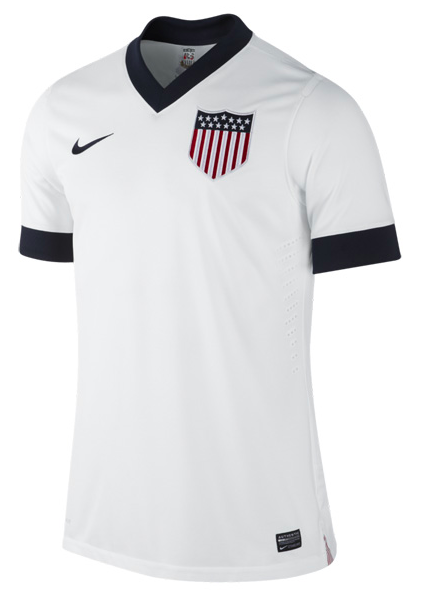 First of all, it seems U.S. Soccer has finally succumbed to the Annual Jersey Cycle, releasing a new kit for fans to shell out huge amounts of money on every single year. Sigh. I guess that's modern soccer for ya. More importantly, though, do we really want this blank white shirt to be our "look"? It doesn't stand out at all among international teams--many of whom have been around for much longer with much more celebrated histories than U.S. Soccer--and these blank white shirts don't give us any sort of identity. 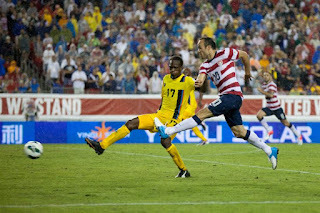 U.S. Soccer has struggled with the Generic White Shirt look for a long time, but they seemed to finally figure it out last year when they unveiled a beautiful red and white striped shirt with blue shorts (pictured on right). The hoops looked great and gave us a real identity we didn't have before. But of course, fans are always afraid of change, and many refer to it disparagingly as the "Where's Waldo" jersey. They were all ecstatic to see a return to vanilla with the centennial jersey. It's a shame. I was hoping the Where's Waldo jersey could turn into a permanent identity for U.S. Soccer as our national team slowly becomes a real player on the world stage. If we're lucky, U.S. Soccer will return to the red/white horizontal striped look for the World Cup next year in Brazil. If we're lucky. I think vertical red and white stripes is a good identity for US national team. Can barely resemble '94 World Cup "classic" uniform (http://www.piccoloniccolo.com/images/p2010/1994_away.jpg) . It's different from the majority of the national teams. Despite the fact that US flag is horizontally striped. PS. : Of course, it's not necessary to "wave" the stripes.